IMPORTANT: Choosing the right kitten from any breed should be important to any cat lover. We support adopting cats from animal shelters, but if you have your heart set on a certain breed, whatever it may be, you should do your homework. Not all cat breeders are reputable. Do your homework. A little research will save you a lot of heartache, money, and time in the future. I continue to hear horror stories from people who have been duped by breeders who sold them sickly or non-pedigreed kittens. If you purchase a kitten instead of adopting one from a shelter, it pays to know where you’re getting it from. To learn more about choosing a reputable breeder, see our Breeder Information in the Advice menu. This is an important article to read for the money you will be investing in what will be a family member. One of the most important things I can tell you is that you should never buy a kitten from a breeder who is not up-front about the kitten’s parents. A reputable breeder will be forthright with you about everything concerning the parent cats. Do not hesitate to ask any question about them and to see the parents. ASK TO SEE THE PARENTS’ PEDIGREES! Tiny Lions Napoleons is a no-cage cattery, with the number of cats we have being small. We integrate our cats into the family so we can enjoy them just as much as anyone who has a cat as a pet does. As such, our cats learn to socialize with people, dogs, and other cats. When you get a kitten from Tiny Lions Napoleons, they will have the same social interaction as our adult cats when they go home with you. Although not always a given, a rule of thumb is that the kittens will generally have the temperament of their parents. I don’t believe this is necessarily true, since our two girls are sisters and have different personalities, but we still provide a synopsis of what our cats are like so you can determine the qualities of the parents that might be passed down to their kittens. So you want to be the proud parent of a Minuet kitten. Welcome to the world of sweet, energetic, and smart cats. Minuets will be a source of constant joy in your life and you won’t regret your decision. However, there are certain things you should know before you venture off into buying a Minuet. Read a little more on this web site to help you understand the intricacies of getting a cat from a reputable breeder. You will appreciate the wealth of information you might find with a little research. To see our boy parents (studs, sire, kings), click on Lions. To see our girl parents (dams, queens), click on Lionesses. 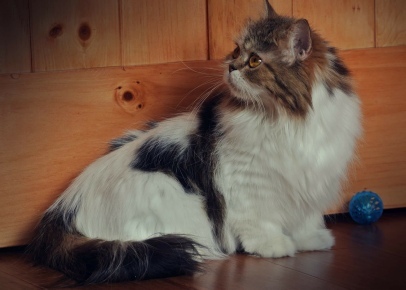 Polycystic Kidney Disease is most often found in Persian breed cats. All our cats have been PKD tested and show negative for the disease. We have also tested our cats against Progressive Retinal Atrophy (PRA) and Mucopolysaccharidosis (MPS VI), both genetic diseases found in cats. PRA causes blindness and MPS VI causes deformities and deficiencies in the skeletal system and other metabolic systems of a cat. All of our cats have tested negative for PRA and MPS VI. All test results are available for review upon request.